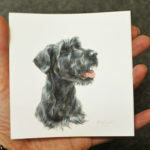 Hi Marjolein, the miniature portrait just came in and it’s gorgious! I am so happy with it, I recognize Poek fully. Really beautifully done! I’ll get it framed and give it a special spot. Thank you so much for this beautiful keepsake. The biggest compliment! My other cat thought Binkie was real and went sniffing behind the painting …….. Thanks to your beautiful portrait of our dear ones, they have been immortalized. Not only in our hearts, but also on canvas. A beautiful view! You are not only empathetic and let that shine through in your portraits, but you are also a real artist! Grateful for your beautiful memory! Our great thanks for the wonderful result of Cathy. In daylight she comes out very nice, you can only see the colors. She is hanging in a good place in the living room and it feels that she’s back with us. Every time we look at her it seems to become nicer. Always other things to be noticed. With the tail slightly up, it becomes more cheerful, yet she looks at you seriously and with this attitude and the fact that she does not live anymore, it is as if she says: “I am leaving and I look at you once more”. That is partly due to the white light / light around her. I have already let some tears go, so it does bring about something; it is also a kind of closure for me. This is what I wanted to let you know. For years I have the opinion that you, as a human being and as an artist, command deep respect. We are so happy to have a painting of our 2 deceased dogs. Still after all these years this painting is enormously valuable to us, even though we now have 5 dogs. I hope to have 2 paintings made of these 5 and a picture of the ponies, kids and other animals that we have. From every piece of your artwork radiates your talent, your intense love for nature and animals. The fact that you can place that love on a canvas / wall enforces admiration and respect! The result exceeds all my expectations (and they were high!). I am delighted with Tommy’s portrait and admire your great talent and commitment. Tommy’s death has left a huge void and with his portrait on the wall he still hears a little bit. The portrait of Saartje has become very beautiful. Even more beautiful than I expected. When we arrived at home, we hung up the portrait immediately. A place where we have a good view on it. Every time it is a party to look at it. Thank you very much. We would like to let you know how incredibly happy we are with the oil painting of our Tika. She is facing the bank and looks at us. She follows you with her eyes, as if she is watching you a bit. It gives a nice feeling that she is with us again in this way. A warm consolation. It’s incredibly beautiful that you can hit the essence of our dog in her eyes with such a small dash of paint. It remains a daily happiness to be able to look at her through your painting with love !! Thank you!!. Wim, Yvon, Maarten van Rijswijk. I would also like to thank you for the beautiful portrait you made of my beloved 3-generation Flatcoats. It was not easy for me: being so touched by them, since their resemblence is very striking it was also confronting. I couldn’t help thinking; seeing them all three, knowing in a while the oldest will be gone. But well then there is still something very beautiful to look at. The portrait has arrived! I am really pleasantly surprised. I really liked the portraits on your website, but now I see my own dogs immortalized, I’m really happy! You have displayed their characters very well. 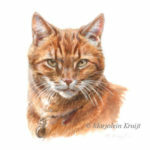 Last month we collected the pastel drawing of our (aged 15 years) cats Shaka and Shauni. Last weekend there was a party at our home. We have had a lot of enthusiastic reactions about the pastel drawing. In particular, about the fact that they have been portrayed lifelike and with so many details. Everyone watched it. We are very proud of it. And many thanks for making this beautiful portrait for us. Yesterday I picked up the portrait from Mickey. Am really very happy with it, it is beautiful! Now I have a wonderful memory of my great cat. A lot of success and fun with other projects and much thanks for my portrait. Kind regards, N. van Vliet.